A new Grade 2 Chronjet Support card is revealed. Auto (RC) GB2: [Counter Blast 1 & Retire this Unit] When your turn ends, you can pay the cost. If you pay it, search your Deck for up to 2 “Chronojet” cards with differtent names, reveal them, choose 1 of them, Call that one to (RC), add the remaining one to your hand, then shuffle your Deck. Auto (RC): When your “Chronojet” Vanguard attacks, during that turn, this Unit gains Power+2000. Today’s Card we’re introducing is from the Character Booster “TRY3 NEXT” (on sale this weekend on December 9th, 2016), it’s a 《Gear Chronicle》 Grade 2 called “Pulsar, Shiftbullet Dragon” that supports both “Chronojet Dragon” and “Chronojet Dragon G”. The ability of “Pulsar, Shiftbullet Dragon” is that when your turn ends, it can retire itself to search your Deck for 2 diffently named “Chronojets”, reveal them, add 1 to your hand and Call 1 to your Rear-guard circle. This ability works well with the return to the Deck ability of “Highbrow Steam, Arlim”. It’s a handy ability that lets you shrink the size of your Deck while securing the cost for your Stride during your next turn. And when your “Chronojet” Vanguard attacks, this card gains Power+2000! You can expect to be an excellent attacker despite such a simple status, and it’s quite charming since you can combine it “Chronodragon Nextage” to activate its ability twice. 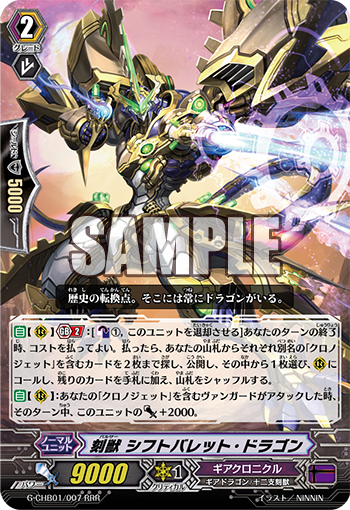 And “Pulsar, Shiftbullet Dragon” also has 《Zodiac Time Beast》 as its Race. It works quite well with the Power increasing abilities of “Metapulsar, Split Pegasus” or “Chronojet Dragon G”. The Character Booster “TRY3 NEXT” contains many cards that support “Chronojet”. Look forward to its release at the end of this week!